When I startup my Win10(synergy server) without login, moving mouse point to the edge of screen(another computer in synergy), the mouse will going hang, It seems gone to another computer but it can't control and also cant go back to the host. 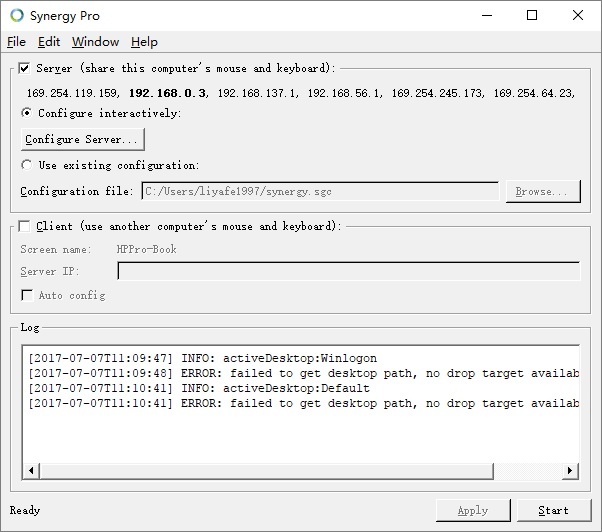 I must turn off wifi to disconnect with the synergy client so that my mouse can be released. Please try setting the elevation level of your machines. Try it with just the server machine first. I set it into whatever Always/As Needed/Never, nothing changed, the problem hasn't solved. Do you have third party firewall apps installed @Strawing? no, it seems not the network problem. I think those information are concern with this problem and it can help you to reproduce the bug. And I found another bug that is when the synergy language set into Chinese Simplified( 中文（简体） )，The option "Elevate" in Setting whatever you set into Always/Nerver/As Needed, after clicked OK and go back to Settings, it always turn into As Needed by itself. It might not really work if there are no user accounts logged in to it. Having a user logged in and not having any user logged in at all is totally different. Yes if it not work when no user logged that ok, but it should not stuck my mouse. Please stop Synergy before logging out and check if still gets your mouse cursor stuck. I have the same problem on my windows 10 synergy server. If I boot up my windows 10 synergy server host, and do NOT login. I can the mouse to the client screen, it will disappear from the server host but cannot move back. I have to stop/start the synergy service on the client in order to return the cursor to the server host. But I can't stop it when windows startup without logged. 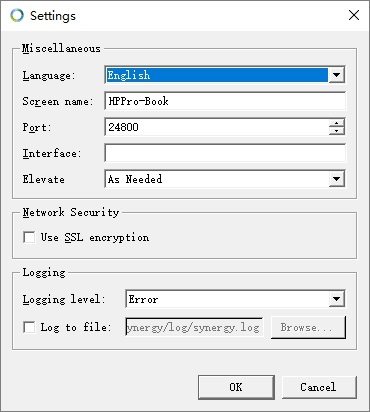 So I think the best solution is add a option in synergy you can disable it when it in winlogon screen. Sorry @Strawing but I'm not understanding what you wanted to say. Can you rephrase that? Sorry of my English skills. This will stop synergy, after loging out my mouse not be stucked surely. But it happens when windows startup without enter password to login. So I can't stop synergy at this time. 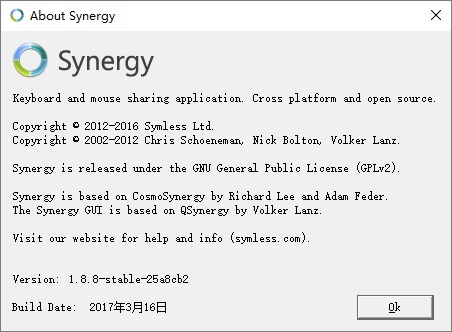 I think the best solution is add a option in synergy you can disable it when windows in winlogon screen, it means make synergy only work in desktop, not worn in winlogon(lockscreen) screen. Basically he's asking if there's a way to have the synergy service start on user login, NOT on system bootup. I think this would solve the problem. I might be able to help explain since I am seeing this situation as well. Server= Windows 10 Pro Build 15063, Synergy 1.8.8-stable-25a8cb2 (64-bit), Ethernet connection, Active Directory, Elevate set to ALWAYS. Client = Windows 10 Pro Build 15063, Synergy 1.8.8-stable-25a8cb2 (64-bit), Ethernet connection, Workgroup, configured to the right of the server. Client has already been booted and has automatically signed in (it is a test system with only one user and no password). Server is initially off. I turn on the server and it comes up on the graphic picture sign-on. If I sign in without touching the mouse then all is fine. HOWEVER, if I decide to move the mouse to do something on the client and then move the mouse back to the server, the mouse will freeze on the edge of the server (right edge for me because of my configuration). Keyboard responds as if it is still set to the client which makes signing into the server now impossible.